A flashblog is a day when a group of people share their thoughts about a single topic. You can post something on your own blog and let us know about it or you can submit your contribution here and we’ll post it for you. Then we’ll share everyone’s posts throughout the day on February 14th, here and across the web using Twitter, Facebook and Tumblr to get the word out. Tell us what “Love Not Fear” means to you. You can write a paragraph or a blog post, contribute a poem or video, make a comic or a graphic. Use your imagination. Let’s tell the world that Autistic people should be loved and that Autism should not be feared. 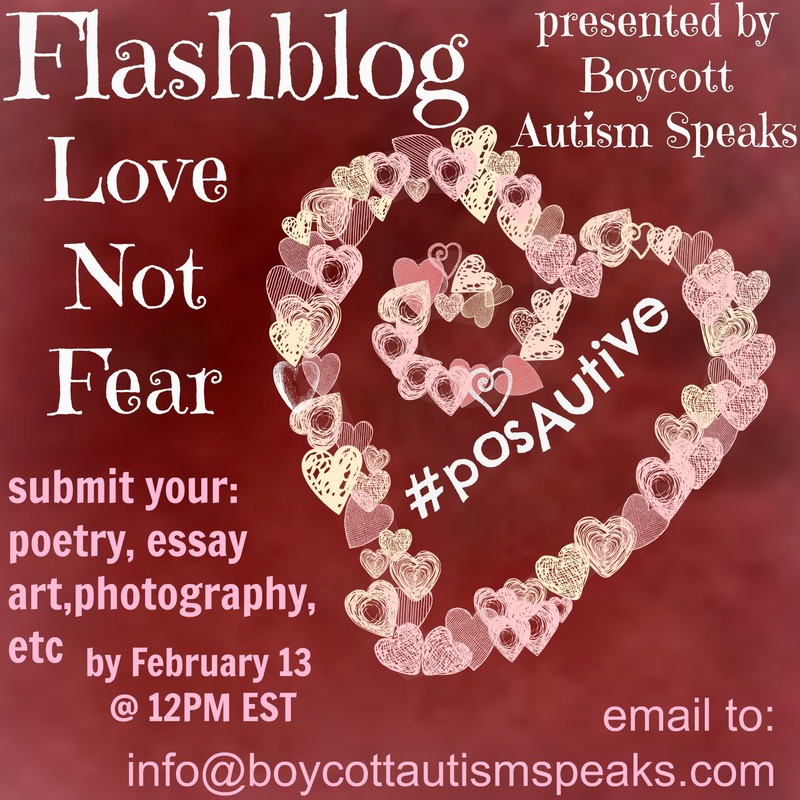 Please email your submission to: info@boycottautismspeaks.com by February 13th @ 12:00PM EST for guaranteed publication (provided your submission is appropriate). You can submit after 12:00PM EST on February 13th, but we cannot guarantee publication. Everyone! The flashblog is open to autistic individuals as well as parents, family members and allies of autistic people. Pingback: Love not fear. Flashblog presented by #boycottautismspeaks | Appalachian aspie. Pingback: Love not fear flashblog entry. | Appalachian aspie. Pingback: Love NOT Fear Flash Blog 2014 | Astronauts are cool.